One way to understand one’s culture is to immerse oneself in the culture one intends to understand. Although the intention to understand one culture’s background might be tricky as the past has become history, it is still possible to reminisce the historical moment of one culture through the visit to the culture itself, in which certain cultures would preserve their local tradition and culture in their homelands. In Negeri Sembilan, if you are interested in knowing more about the local tradition and culture, you can always make your way to the Negeri Sembilan State Museum. 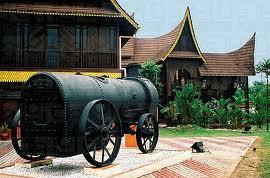 The Negeri Sembilan State Museum preserves all the local traditions and cultures under the roof of the museum. 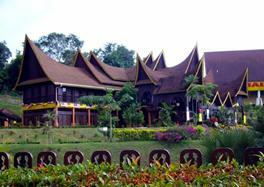 The traditional Minangkabau architecture style used in building the museum is one of the distinctive features the museum possesses in preserving and reflecting the local traditions of Negeri Sembilan. In the Negeri Sembilan State Museum, you would find yourself being exposed to three main buildings which you can tour around. One of the main buildings – the Teratak Perpatih building – will help you to understand more about the handicrafts, woodcraft, artifacts, and many more local hand-made products through the display of these local items in this building. Another distinctive feature of the Negeri Sembilan State Museum is that this museum is made completely out of wood alone. Stepping into the museum will thus allow you to feel the unique construction and design of the building, contributed by the local people who are loyal to their traditional building architecture style. It is also a great place to take photos when you are able to capture the unique structure of the building and in the same time, capturing the effort poured in by the local people. If you are interested with the traditional weapons used by the local people in the old days, the Negeri Sembilan State Museum will also help you to examine the traditional weapons with your own eyes when you can see authentic weapons and silverware being exhibited in the museum. Furthermore, you can also get to know more about the royal traditional wedding in Negeri Sembilan through the displayed tableau which showcases the royal wedding procedure being conducted in the state. The other main buildings you can visit in the Negeri Sembilan State Museum are the Minangkabau House and Ampang Tinggi Palace. As suggested by the name, you can further your learning and understanding on the local tradition and culture in the Minangkabau House. One step into the building will make you feel as though you had been transported to the beautiful culture of the Minangkabaus. The Ampang Tinggi Palace will allow you to feel the atmosphere of the royal tradition in Negeri Sembilan with the unique building structure and decorations you can find inside the building.